Fighting Boredom has made no secret of our love of Birmingham’s Supersonic Festival. Three days of brilliant music, pop-up events, art and much more. 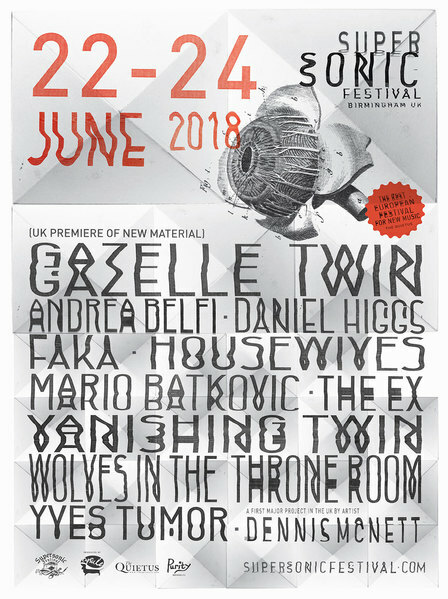 This year “championing an array of ambitious, fiercely independent, and progressive artists, each committed to doing things in their own unique way.” Taking place in Birmingham from June the 22nd until the 24th this is the festival to be at this year. The brilliant Gazelle Twin with a premier of their new album, they last played in 2015 and we described them as “genuinely and mind twistingly disturbing” so that’s a highlight for us. Dutch innovators The Ex are playing the annual Supersonic kid’s gig which last year hosted a riotous Melt Banana set. The first art event to be billed is the first major UK event for artist Dennis McNett. In collaboration with a number of the musicians and audience members at the festival, Dennis McNett will create a large-scale procession piece. Mario Batkovic the Swiss, Bosnian-born accordion player will be pushing his instrument to it’s limits. Faka, a South African music and performance duo will be expressing their experience “as black queer bodies navigating the cis-hetero-topia of post-colonial Africa”. Housewives will provide a “cold, minimalistic” “anti-performance”. Wolves in the Throne Room are back giving us their wonderful take on Black Metal. Lastly the vocalist of Lungfish Daniel Higgs will be performing. It looks like yet another brilliant year. Fighting Boredom will go to Supersonic with a list of bands to see and come home afterwards with a list of bands to check further. Come and experience the most interesting and challenging festival in the UK. You can find ticket details on the Supersonic website on this page.